I recently read my first Sci Fi book… at least I think it was the first, and yet… in a life of reading I must have read one before and anyway it was listed under adventure, and I am always up for that. 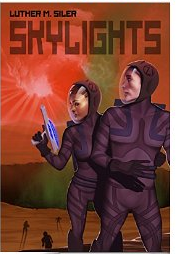 I enjoyed Skylights very much and reviewed it on Amazon. I read it because I have become interested in the author Luther M. Siler via his blog and happened to read the opening of this book which gripped me. It is set in the future, but starts in a schoolroom as the assembled children are watching the launch of the Challenger in 1986. However, I had forgotten, I have been to space before, nearly thirty years ago. Our youngest daughter decided, age four, that she wanted to be an astronaut. So we made her a space ship. Here are the engineers at work. 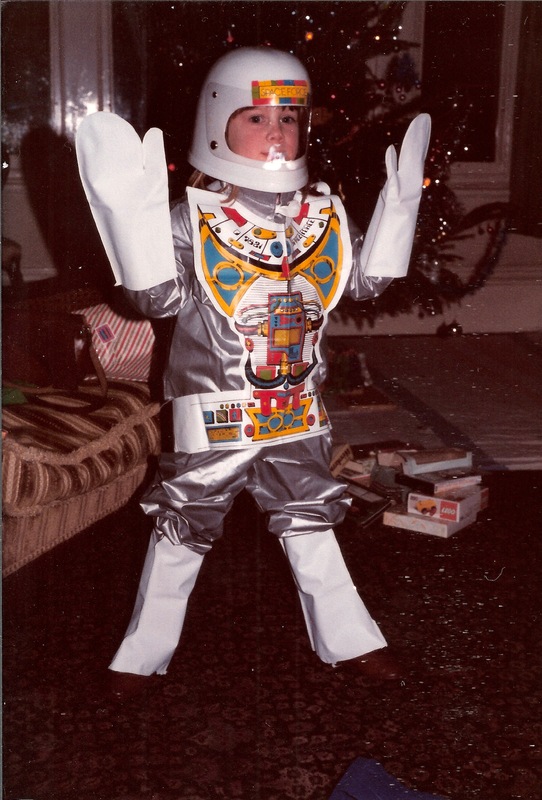 For christmas that year she had a space suit. 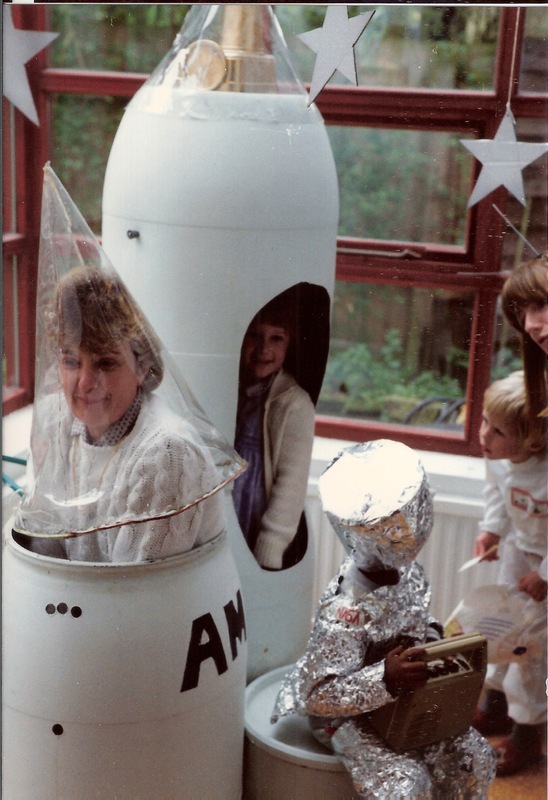 And on her fifth birthday the next year we created a command centre (with lights, recorded sounds etc) for the main module of the space ship and she invited her friends to come to space with her for fifth birthday. One of her friends wanted to know if he should bring his pyjamas. They all took turns in three roles – pilot, navigator and engineer (I think). Note the Fischer-Price communications system. She also invited her wonderful first year teacher, who miraculously came. And even more gamely squeezed on board. Even the cake was ready to be launched (note the candles underneath). I don’t want to end on a sad note, but it is only now that I realise that we could not have held the party a year later. This was 1985, in 1986 the Challenger attempted to take off into space with a brave and enterprising teacher aboard. Teachers are the amazing. We were lucky, space exploration was all hope and success then. 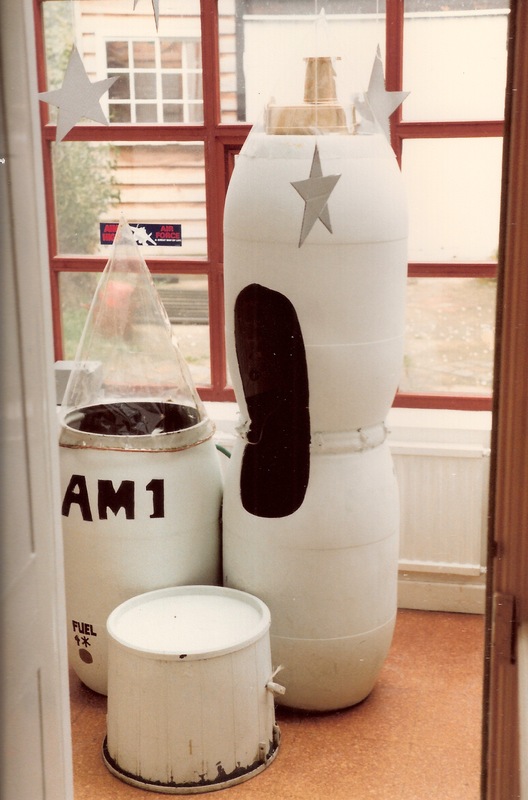 We had a wonderful, memorable party and the spaceship lived on in several incarnations ( a feature on a float, a rhododendron pot, a pots container…). This entry was posted in Reading, Writing notes and tagged astronaut, Birthday party, Luther M. Siler, Skylights, Space exploration, space ship, the Challenger by hilarycustancegreen. Bookmark the permalink. That may have been the cutest post I’ve read in a long time! What ingenious engineers you were. It was fun all the way at the time. Cleaning the barrels, I think they had had some kind of industrial jelly in them, was the hardest part. Okay, I know I literally JUST SAID I wasn’t posting more than once a day for a while, but there’s absolutely no way I can pass up reblogging this amazing story. Thanks so much, I wondered what had happened to my inbox, as my followers are modest in number. Reading your book meant I recalled that very happy episode and also scanned some old photos into my iPhoto, so all good. What a wonderful time you gave her and her friends, Hilary ! – AND their teacher ! I see that Susanne (herself of course a mum) give your post due accolade. 🙂 I’m not a mum, but I think any kid thus encouraged in something she loved must have grown up to be a fulfilled woman. Is there any post in the blogosphere you have not read, Margaret-Rose? Yeepers! I feel like I keep running into “Kilroy wuz here.” ..m.( oUo ).m..
Didn’t you know, M-R has infiltrated our consciousnesses with the pure power of thought. Here are three. Up to you, of course, if you try ’em. You may have already! The first two I hadn’t sent you when they were Freshly Pressed because they were identified with the recent December holiday, and I knew you needed not have that reminder. But Margaret-Rose: The first is SO clever, SO up your alley, and the holiday connection is negligible–an excuse, you will see, for a sharp wit to strut its stuff. The second is a good shory, well-told–and even after all we already know about the topic, still evokes a “Geez, Louise.” It is NOT a holiday story. It was just posted then. The third is not as dramatic a topic, but does its job well–possibly better than the same job has been done before. STOPSTOPSTOP !!! Already I am beside myself trying to fit in all the sites I am committed to read, OB ! – if you keep adding to the list, my poor old coccyx will collapse in pain. Ohhhh..too bad. The underscoring html didn’t “take”. Looks like a blot. Ah, well. We all had fun. 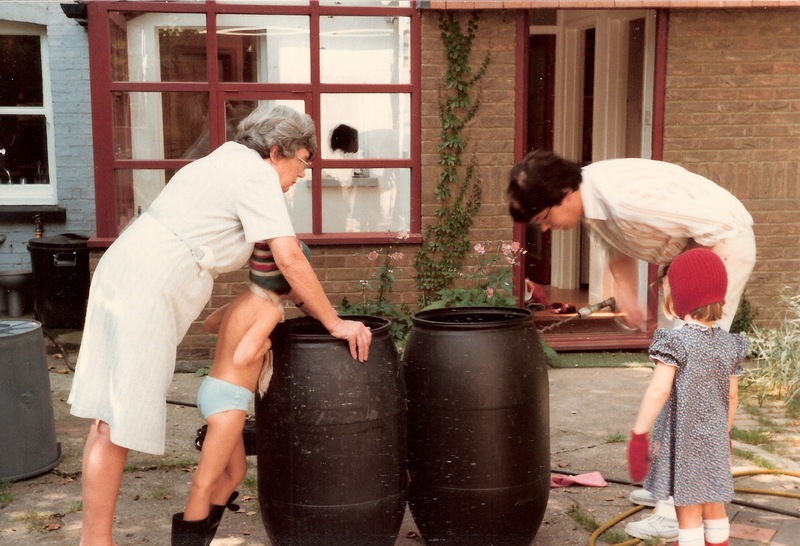 I like to think they have both grown up fulfilled, they are certainly pursuing their own dreams… but it is on my conscience that she never got rocking horse, the Newfoundland (dog) or the harp (though my father made her a zither), or to paint all our downpipes and gutters purple. Lovely revival of the past. We never went that far in building space ships but did go for endless camping trips. Albums full as a matter of fact. Mmm, I camped much of my childhood, but I never persuaded my husband or children beyond a couple of trips. Multiple albums – we got ’em too. What an enterprising Mum you were!! I love the costumes and the rockets, but most of all the candles in the rocket cake!! Great photos too. Well the cake… I can’t bake, but I’m a dab hand at construction, and at that age you can get away with first impressions. I enjoyed this enormously. Very innovative to build a space craft. I always wanted a TARDIS. I have my first (?) sci-fi in my reading pile, introduced to me by the son of a friend, who reviews sci-fi books on his blog. 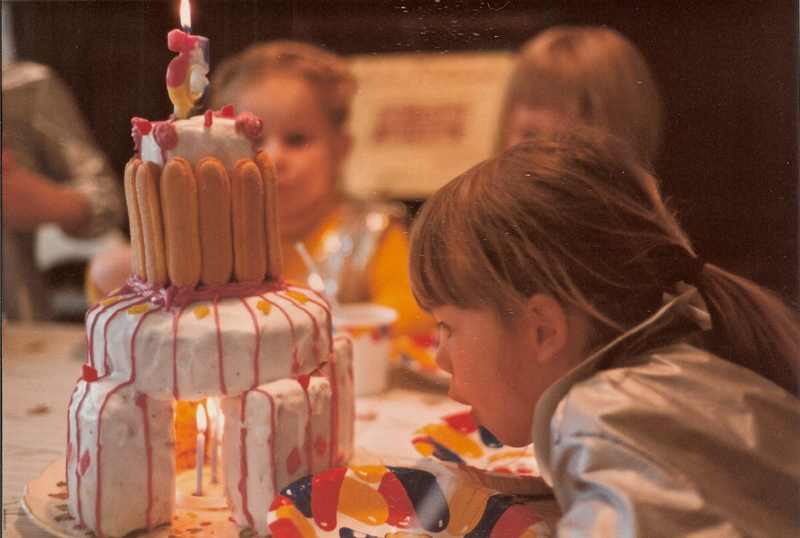 I think you should do the cake again next time your daughter has a birthday. Now there’s a challenge. She has become rather a good cook and I have never yet made a successful spongecake… As to the construction, four-year-olds aren’t that fussed about cowboy builders, so anything goes. That is a terrific story. Thanks for sharing with your photos. Thanks, it’s good to revisit the past occasionally. Adorable. I made a rocket for one of my boys, but it was a toilet paper tube compared to this. What fun! The fun is what they felt at the time. I think the head cone on the rocket is ice-cream and yogurt pots. Ha ha ha!! Kindred souls: I was praised for a Christmas Faire Bethlehem which made liberal use of Cool Whip containers. This is so lovely. Those spaceship pictures are gorgeous. Thanks, it was fun at the time. I am amazed at how well the old prints scanned into my computer! I’m impressed. We never got round to such enterprise. You no doubt did other things, music? I used to worry that I had had more fun in my childhood, canoeing and camping. I think the children themselves direct things more than we realise. Mine dressed up and put on plays, but sports… nah. I just bought this one and a short way into it, am totally impressed. Yup, the writing is fluid and the detail inventive and fascinating. Oh wow, what an awesome looking spaceship & command centre! My 7yo son would love one of those! He’s always building things with paper and cardboard. I think your children direct you to a large extent, even if we hadn’t joined in and expanded the project, she would have built a spaceship of sorts herself. Enjoy Skylights, it was certainly a (surprise) hit with me. We had lots of fun too, so lucky parents as well. A fantastic and uplifting post, Hilary. Thank you for sharing. The costumes and scene settings in the pics are amazing! If that doesn’t inspire, I don’t know what does 🙂 Have a great week. Thanks, I was lucky to have a reminder by reading Skylights, which made me revisit those happy days. Have a great week yourself. Thanks. It was fun all round. Thank you. Some things just work out. I was working as a sculptor then, so turning out biggish structures was what I liked doing best. Most of their childhood costumes were of the pillowcase and ribbon variety. What a darling story, Hilary! And to know reincarnations are still happening. ☺ Did she continue in her interest of space and “the final frontier”? Oh, to have an astronaut amongst you! I think that has to be the best teacher ever! And you were a pretty awesome mum too! I love the space suit. Darn it, I never thought of that. Eventually I taught SPACE for science olympiad as a volunteer at my kids school. Well I should clarify, they taught me about space. We did rent an inflatable universe from the local space museum that sat 25 people at a time. 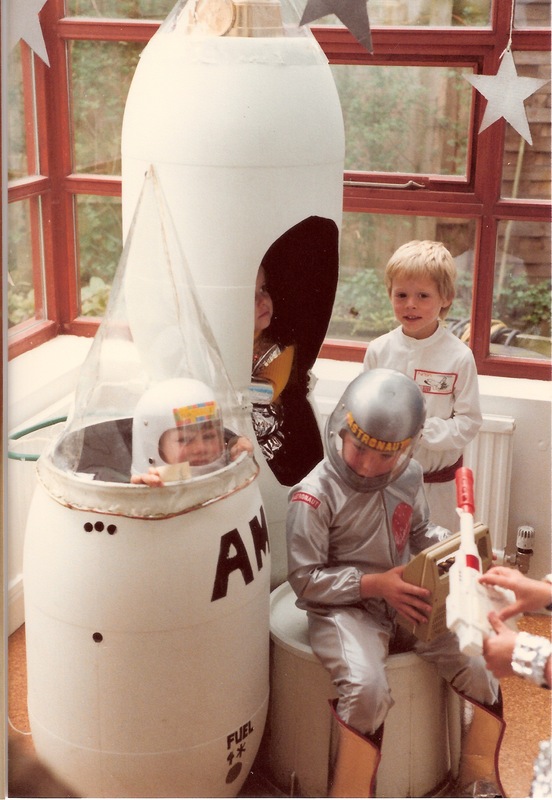 I had to sit in this bloody thing for days on end, as of course all the kids in the school wanted to go to space! Your post brought back happy memories! I’m glad this brought back happy memories. We knew nothing about space, it was just this strange obsession that our youngest had and it lasted a couple of years, then faded away (as these things do). Your dedication to the subject clearly went deeper and lasted much longer. This teacher ran first year for both my daughters and was wonderful. Sadly she has been ill for many years, but we still exchange Christmas cards.